The Challenger having been gone for three decades arrived on the scene last year in only one variety – the 2008 Dodge Challenger SRT8. Though a late model year offering every Challenger SRT8 was sold before the first one rolled off the assembly line. The SRT8 offers the complete package for any high-performance pony car fan. With a 425 horsepower 6.1 liter Hemi V8 and other accompanying performance trimmings, the Challenger SRT8 is simply irresistible. Then one look at the $40,000+ sticker price and suddenly reality sets in, and the dream of owning a new high-performance Challenger seems way out of reach. Fortunately Dodge has this problem covered and is offering the high-performance 2009 Challenger R/T to those on a tight budget. The Challenger R/T has a base price of $29,995, quite a bit less than its SRT8 brother while offering almost as much performance. In other words the R/T will be the Challenger that will offer the most bang for the buck in the Challenger lineup. 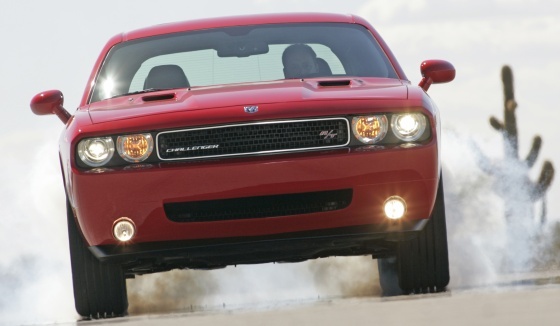 The 2009 Dodge Challenger R/T comes equipped with only one engine, Chrysler’s 5.7 liter Hemi V8. The good news is that the 5.7 Hemi for 2009 gets more horsepower and torque. The main reason for the 30+ horsepower jump is the use of variable cam timing. 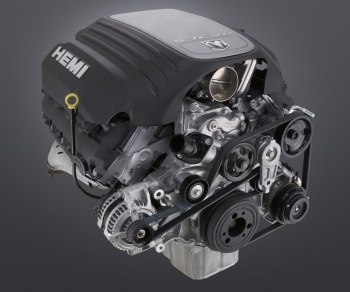 This second generation 5.7 Hemi also has the added benefit of having a more sophisticated Multi-Displacement System (MDS) which deactivates four cylinders when eight cylinders are not needed to provide better gas mileage. The MDS on the first generation 5.7 Hemi has proven to be very reliable. The new MDS of the second generation 5.7 Hemi takes this system to the next level. The net result according to Chrysler is a 5 percent MPG gain with the new MDS vs. the old MDS. With the current high fuel prices the increased efficiency of the new MDS is a welcome change. The 5.7 Hemi produces 370 horsepower with Chrysler’s five-speed automatic transmission and 375 horsepower with a new six-speed manual transmission. Dodge is claiming 0-60 mph times of less than 6.0 seconds for both transmissions. For an over 4,000 lbs coupe this is very impressive. It’s also a safe assumption that the new R/T will break with ease into the 13 second 1/4 mile range. However to show the R/T’s real potential is the abundance of torque that propels the Challenger R/T like a rocket. The five-speed automatic transmission equipped R/T will produce 398 lbs/ft. of torque, while the six-speed manual transmission equipped will produce 404 lbs/ft. of torque. To get a clear understanding of how impressive these figures are, they are so very close to the 420 lbs/ft. figure of the SRT8’s monster 6.1 liter Hemi. Standard on the R/T will be a dual exhaust system that will have the SRT8’s dual rectangular exhaust outlets giving the R/T a mean exhaust sound and look. The SRT8’s racing style fuel filler cap is also standard on the R/T. The interior is very well done on the Challenger R/T. Those familiar with the current Dodge Charger’s interior will see how similar the Challenger’s interior is to it’s Charger cousin (the Challenger is built on the Charger’s LX platform). And one added advantage when compared to the competition is the Challenger’s far superior rear seating head and leg room. Unlike most sports coupes today five people can fit very comfortable in the new Challenger. And to those who like the Charger’s big trunk space the Challenger matches it with a trunk with 16.2 cubic feet of space. Making the R/T appeal to those who like the cargo space of a large car. It’s really a step back in time to the golden era of the muscle car when you could have a fast muscle car that five adults would fit comfortably in and fit loads of luggage in the trunk. The exterior of the R/T is very attractive and looks almost identical to the Challenger SRT8 which needs no introduction for anyone who has not been stranded on a deserted island the last year. The retro lines on the Challenger concept car (which the SRT8 is based upon) made it a popular attraction on the car show circuit. In a lot of respects the Challenger R/T is a better looking vehicle than the SRT8. The R/T is sporty looking with having the same front chin spoiler and rear deck-lid spoiler of the SRT8. The rear deck lid spoiler on the R/T is body colored instead of SRT8’s flat black. The R/T has the advantage of not having the SRT8’s boy racer hood stripes, giving the R/T an overall clean and mean look. And unlike the SRT8, which only comes in three exterior colors, the R/T has nine exciting colors to choose from. 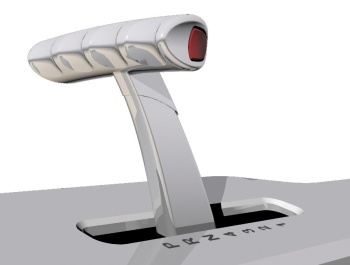 The Challenger R/T will have a multitude of modern standard features and options. Everything from an electronic sunroof to a high-end navigation system is optional on the R/T. Traction control along with Electronic Stability Program (ESP) will be standard providing fast take-offs and stable handling and control. And of course these two items can be disabled at the push of a button for those requiring the ability to do burnouts and other similar old school maneuvers. Interesting to note, even though the 2009 Challenger R/T and SRT8 are the first rear-wheel drive V8 powered Mopar cars to come with an optional manual transmission in many years, Dodge did not cut any corners. The new six-speed manual transmission has Hill Start Assist (HSA), which aids the Challenger in moving from a standstill on a hill without the common roll back. Anyone who has ever driven a manual transmission will know how much fun it is to stop on a steep hill and have an idiot driver stop his car a few inches from the rear of your car. With HSA these worries are now gone. Handling is also covered in the R/T. It has a very good handling 4-wheel independent suspension that does not sacrifice ride quality. The R/T comes standard with 18” wheels with P235/55R18 BSW all-season touring tires and optional are a set of 20” wheels with P245/45ZR20 BSW all-season performance tires. Also standard on the R/T is a performance oriented 4-wheel disc antilock braking system. As if all of this was not enough, Dodge decided to add some nostalgia to the R/T by offering the “R/T Classic” package. This package adds retro side black stripes and 20” retro American Racing torq-thrust style wheels with P245/45ZR20 BSW all-season performance tires. Also available from the Mopar accessories catalog is a retro Challenger T/A style hood scoop, a retro (Hurst style) T-grip shifter handle (for the automatic transmission), and a wing shaped rear deck-lid spoiler. 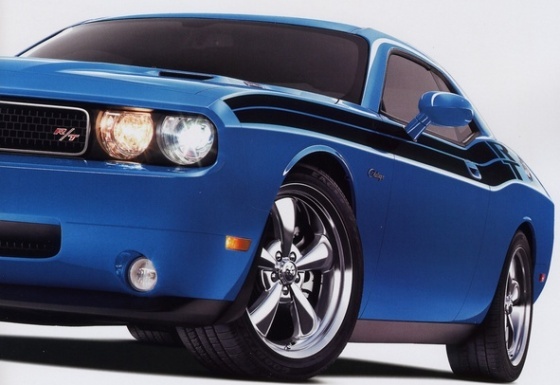 There’s also an optional Challenger R/T striping scheme (if the Classic’s scheme is not to your liking) that starts on the sides of the hood and runs horizontally along the sides of the R/T. With all these appearance options/accessories it’s like 1970 all over again. With the multitude of options it’s fairly easy to make an almost one of kind Challenger R/T. With possible even higher fuel prices and the upcoming big uptick in the Corporate Average Fuel Economy (CAFE) Standards, the storm clouds are gathering on the horizon for performance cars. The Challenger and its competition may not be around for too long. And even if the Challenger weathers the storm, the high-horsepower 5.7 liter Hemi V8 may not be so lucky. So if you want a new 5.7 Hemi R/T you better not wait on the sidelines too long. Rarely in life does lightening strike twice. With the Challenger it has. Who would have thought that we would have an opportunity to buy a new Challenger R/T Hemi that matches the looks and performance of the 426 Hemi and 440 Six-Pack 1970–71 Challenger R/T? If I had a million dollars, I’d buy a bunch of 2009 Challenger R/Ts and pack them away. So what are you waiting for? Get off your rump and buy one before it’s too late.